Live theatre isn’t enough any more. Instead, we have a transatlantic telly/theatre hybrid rather casually inserted into the weekday evening schedule on ITV2. 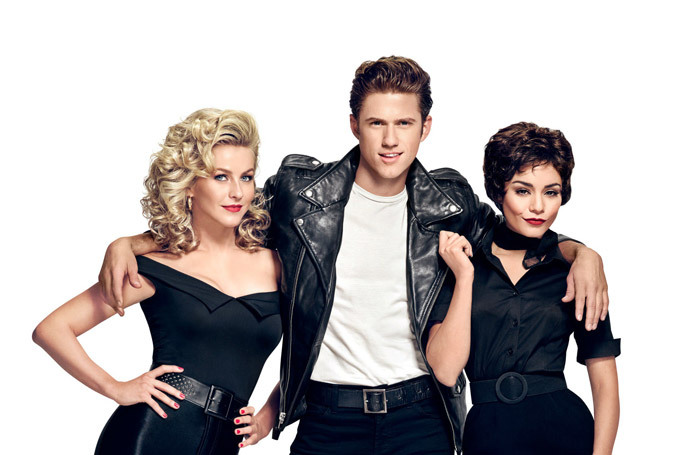 The UK is four days behind the US in getting to see Grease: Live, an epic made-for-TV broadcast that mashes up the film and stage versions, combining songs from each. And it’s stuffed with more stars than an astronomer’s handbook (there’s Jessie J. And Joe Jonas. And Vanessa Hudgens and Carly Rae Jepsen and Wendell Pierce and shed loads more American singers, TV presenters and actors). As a spectacle it’s great fun, the technical achievement is mightily impressive, and it’s nice to have front row seats with a cup of tea and a cat on one’s lap. But, by cramming so much in, it moves at the pace of someone sprinting through treacle – and whenever it begins to hit its stride, there’s an ad break. There’s an obvious visual debt to the film – Vanessa Hudgens is the absolute spit of Stockard Channing as Rizzo, though she makes the role her own – her version is funnier and sassier, more Mean Girls than Happy Days. The songs are also as wonderful as ever. Les Mis star Aaron Tveit isn’t a bad Danny Zuko and Julianne Hough’s Sandy is impressively bland, but she and Tveit can really dance. In fact, it’s the choreography from Glee’s Zach Woodlee that gives the broadcast its zing, particularly in the colossal ensemble dance numbers set across the 20-acre set. Those set pieces are what this show is for: a big, buzzing event that showcases scale over skill. Because aside from Hudgens and Tveit a lot of the vocal performances are quite weak – there’s a stunningly underwhelming turn from Jordan Fisher with Those Magic Changes. While Keke Palmer’s rendition of Freddy My Love, with a quick change and a bedroom expanding into a huge concert hall, is one of the strongest directorial flourishes, it’s High School Musical’s Hudgens who is the stand-out as a particularly cynical Rizzo. In fact she’s probably the only lead cast member – aside from Ana Gasteyer as a hilarious Principal McGee – who makes her character a character. Considering her father died the night before broadcast, this is a really admirable performance. On top of everything else, the whole grand spectacle is performed to a live audience which makes this feel a bit like The X Factor, but with a plot. Despite the scale and the star roster, Grease: Live is an unwieldy beast that doesn’t quite hang together. It’s a masterclass from a technical perspective, but some of the performances let it down.